Very occasionally, a little piece of extra special magic drops through your door and one such piece is unquestionably The Woman in the Window, the sparkling debut from New York based author A J Finn. But one evening, a frenzied scream rips across the silence, and Anna witnesses something no one was supposed to see. Tight descriptive prose doesn’t so much jump out but rather rush headlong into you, barrelling you over wielding a literary knife with which to stab your psyche. Short, razor like sentences sear into your consciousness, settle themselves down and kick off their shoes intent on remaining locked in your mind for keeps. The tension, immediate and in your face, is almost unbearable at times, but you feel compelled to continue thanks to the deliciousness of the writing. In Dr. Anna Fox, Finn has created a tour de force. Disabled and enabled in equal measure, although deeply flawed her take on life – and death – is so admirable, we can all only wish to be as capable were we to be so inflicted. The manner in which mental health issues are handled, too, is a tribute to the writer’s skill set. It could have been so easy to have drawn Fox only as some loner in self-imposed exile. Here, however, we get a very real sense of frustration and isolation from the character through her somewhat limited interactions with others. The dialogue is simply superb. A zingy, edginess rattles through everything that’s uttered, which not only adds a dangerous pace to proceedings but also depth to scenes that might otherwise be somewhat convoluted and drawn out. Dr. Fox is good fun, but she also generates equal amounts of empathy and sympathy without ever coming across as some diluted ‘victim of her own choosing’. The plot, with noir movie and film-star-of-yore references shining bright, may seem on the surface to be something of a parody – an homage, almost. Yet the very fact that the author’s love of all things Hitchcockian is so blatantly displayed, it’s as though old Alf had been sitting on Finn’s shoulder during the writing process, guiding, giving his blessing and inserting ideas for each fresh Magguffin and Red Herring from beyond the grave. Yes there are twists aplenty, more than enough to have kept even the iconic British movie director happy, but each is so beautifully crafted, polished and disguised, it’ll be a good detective that works out who’s done what to whom before the reveal. 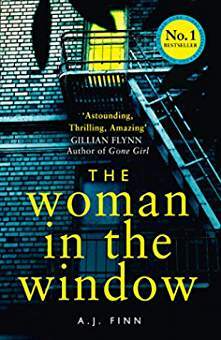 In short The Woman in the Window is a little gem – a magical joyride – and although there may be a lot of books published this year, few if any are going to better A J Finn’s The Woman in the Window and of that we can be certain.